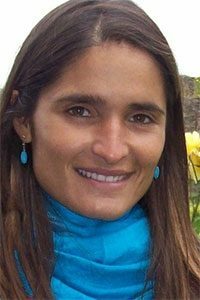 Currently, Sindia is a postdoctoral research associate working at Cardiff University in Wales on reconstructing records of sea surface temperature and atmospheric carbon dioxide concentrations across the Middle Miocene Climate Transition. This epoch, about 16-11 million years ago, was a period of sharp drop in global temperatures and relevant to climate change science. Born and raised in Howell, a small suburb twenty minutes from Monmouth University, I grew up surfing the sandy beaches all along the Jersey coastline. As an avid surfer and ocean enthusiast, I was keen to understand what conditions produce big, clean waves like that of the North Shore of Hawaii! I was aware that changes in the climate system elsewhere on Earth played a role in shaping the swell of waves I surfed across the seasons, but I didn’t know how or why. These niggling questions and thoughts pushed me to pursue an undergraduate degree in Science. I hoped to fill in my knowledge gaps about my local surf beach and wind, waves, and weather that shaped it. I chose to study at Monmouth University, as the small class sizes and the potential for establishing nurturing relationships with the faculty seemed like an ideal fit. 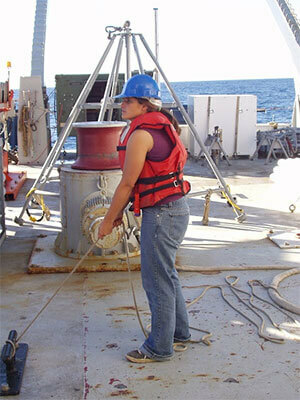 Sindia collecting a sediment core on research cruise during her PhD studies. My time at Monmouth University was the stepping stone for my career as a paleoclimatologist – one who studies past climate. This interdisciplinary field bridges geology, oceanography and chemistry and attempts to understand how and why climate changed in the past. It all started with my physics professor, Dr. Lou Kijewski. He was a entertaining, thought-provoking lecturer who mentored me in oceanography, which was outside of my chosen degree in chemistry. Through fruitful discussions with him and small research projects, I developed a curiosity beyond my surfing and beyond my NJ backyard. I was inspired to think about the Earth system, and tackled learning the fundamentals in oceanography. Dr. Kijewski suggested that I indulge my curiosity and attend an undergraduate minority advancement program at Scripps Institution of Oceanography- a top school in oceanography and the site of the world-famous surfing beach Blacks. It seemed like a no-brainer, win-win, in and out of the water. This pivotal summer, where I organized minerals under different magnetic fields, solidified my fascination with using the geological record to study past environmental change. Thus, when I finished my B.Sc. in chemistry, I began a PhD in climate, oceanography, and chemistry. And so, unwittingly, I began my path to an academic career in Earth Science. I didn’t travel far as just nearby at Rutgers University lies the top-ranked Institute of Marine and Coastal Sciences. Here I completed my PhD and had the opportunity to sail on several sediment coring research expeditions where I was introduced to the fundamentals of geoscience through hands on experience mapping the seafloor, sampling and dissecting mud from 4 km below, and mapping the biogeochemical properties of the surface ocean. My PhD research focused on understanding why and how Greenland became glaciated initially. I extracted the geochemical fingerprint in “cell-sized” thermometers called foraminifera to look at changes in temperature and the size of continental ice sheets. Foraminifera grow in the ocean and once they die their hard shell descends to the seafloor and is deposited until we collect it. Our study highlights the role of both greenhouse gases and the dynamics of ice sheets in earth’s climate history and suggests that to predict and mitigate future climate change, scientists need to look closely at how ice sheets change in addition to greenhouse gases. These new observations give us a better understanding of the sensitivity of Earth’s climate to changes in greenhouse gases and northern hemisphere ice sheets, which aren’t easily understood solely from climate models. Since my time down under, I moved to Cardiff University in Wales trying to understand climate change across the last five million years. Just this year I joined the department as a professor in their Earth & Ocean Sciences department. My hope, as a professor, is to appeal to the innate scientific curiosity of students, encouraging them to think critically about Earth’s processes and how these affect their own day-to-day lives. My undergraduate experience shaped the way I think about teaching undergraduates and engaging with them. I hope to inspire my students to develop their curiosities as was done for me at Monmouth.After graduation, I received the Sir Keith Murdoch Fellowship to develop my research in Australia, a good location for surfing and science, at the Australian National University (ANU). The focus of this project was to understand past climate change using tracers in coral skeletons. I island-hopped for several months around Indonesia searching for ideal corals to core, and in doing so, I got to surf world-class waves in Bali as a byproduct!